Derek Lyle's goal 19 minutes from time maintained Peterhead's five-point lead at the top of League Two. Jack Leith had cancelled out Tony Wallace's opener for Annan before Lyle thumped in the winner. Second-place Edinburgh City were 2-0 winners at home to Queen's Park. 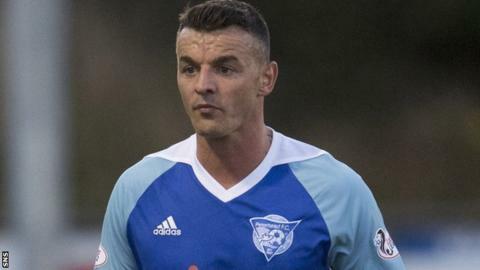 Third-place Clyde fell further away from the top two with a 2-1 loss to Elgin, bottom-of-the-table Albion Rovers beat Stirling 1-0, while Berwick and Cowdenbeath drew 1-1. Queen's Park played the last 32 minutes with 10 men after Allan Gow was sent off for two yellow cards. By that time Blair Henderson had already given Edinburgh City the lead, and Ciaran Diver added a second with five minutes to go. Clyde began the day reeling from a four-point deduction after being found to have fielded an ineligible player last month. And 10 minutes in they were behind to Elgin City from Ross Maciver's header. John Rankin drew them level just before half-time, but Maciver scored his second with 11 minutes to go. The bottom two both picked up points. Calum Adamson gave Berwick the lead against against Cowdenbeath, but it lasted just seven minutes before Robbie Buchanan equalised. Berwick finished the game with 10 men when Declan O'Kane was given a straight red card in the last minute. Albion Rovers won just their third league game of the season, and their first on the road. Gregor Fotheringham's fourth-minute goal was all they needed to pick up the points.